When reading or talking about wood, we run across technical terms and jargon. Some may be familiar to us and others may leave us wondering where they came from. Understanding these specific natural characteristics of wood can help us draw connections between the things we know and the things we have yet to learn. Touching on a just a few terms: Pith, Fleck, Turkey Tracks and Glassworm. They may be common language to folks that work with Maple and Ash lumber and veneer but many of us have something to learn. These terms are used to describe three distinct visual characteristics that are linked together by a group of insects called Cambium Borers. Cambium Borers burrow into the layer just below the bark of a living tree during the growing season. This layer is called the cambium. The tunnels damage the living tissue and the tree reacts by filling the voids with scar tissue. 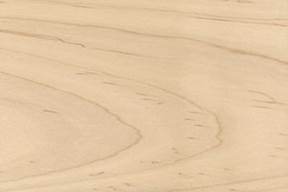 When the wood is eventually machined, the tunnels are revealed on exposed surface features that we have come accustom to identifying as Pith, Fleck, Turkey Tracks, and Glassworm. Because these features are small in size and well distributed, their structural damage is insignificant and are typically only considered visual defects. 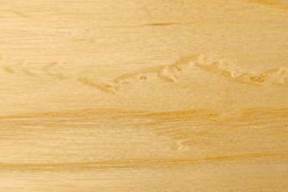 In Figure 1, you can see an example of pith fleck in soft maple. Pith fleck appears as an oval or oblong spot in cross section, but as a somewhat irregular or intermittent streak on the face. 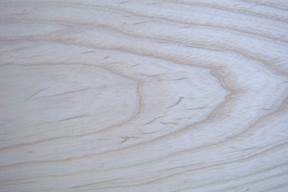 Pith flecks commonly occur in maples and birches, however, they can also be found in many other hardwoods, including basswood, willow, cherry, and aspen. As you can see in Figure 3, turkey tracks in white ash are very similar. They are both caused by the same type of scar tissue developed by the tree as a result of Cambium Borers. The zigzagging glassy feature in Figure 3 is called Glassworm. The glassy appearance of scare tissue is often persistent even through the finishing process. Although Glasssworm appears differently, it is also caused by Cambium Borers. Glassworm is a feature that is almost exclusively associated with Ash. The uniqueness of these features is just a small part of what makes wood the warm, natural, and organic material that makes our industry special. These features tell the story about the life of the material and make it personal. ← Why do I write about wood?! ?